Wounds in the diabetic population represent a significant medical and economic burden. If foot pressures are to be reduced, healing to progress, and prevention of ulceration to be a realistic goal, offloading is imperative. The first installment of this two-part article will discuss offloading strategies for healing difficult diabetic ulcers. The second installment will discuss preventing ulcer recurrence and management of Charcot foot and foot amputations. The main cause of foot ulceration is neuropathy (Figure 1).11 This leads to prolonged and excessive pressures that cause tissue breakdown. 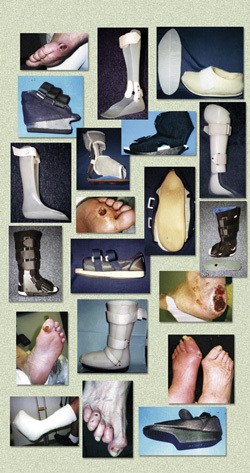 Using footwear as a means of healing open wounds is rarely desirable.12 Currently, total contact casting (TCC) (Figure 2) represents the gold standard for the treatment of forefoot and midfoot (Wagner grade 1-2) diabetic and neuropathic ulcerations; however, reduction of heel pressures with this device remains controversial. Myerson et al13 estimated that six weeks of treatment in a total contact cast costs the same as a single day of inpatient treatment. Specialized casting protects the foot from trauma, immobilizing skin edges and reducing edema. It decreases pressure over the ulcer by redistributing the weightbearing load over a greater plantar surface area. Molding the bottom of the cast to the bottom of the foot causes the entire sole to participate in the force distribution, resulting in lower pressures.14 In 1985, Birke et al15 reported 75% to 84% reduction of peak pressure at the first and third metatarsal heads, respectively, when subjects walked in a cast. Many other studies have supported the successful rationale for TCC use.13,16,17,58 For example, Sinacore et al16 noted healing in 82% of 33 ulcers after an average of 44 days in a total contact cast. Myerson et al13 observed healing in 64 out of 71 (90%) ulcers at a mean of 5.5 weeks. Hanft et al17 performed a 10-year retrospective study utilizing total contact casts on more than 1,000 patients. The research demonstrated a healing rate of 91% within 13 weeks with an average closure time of 4.36 weeks (± 1.31 weeks). It was concluded that the total contact cast was an effective, low-risk, and inexpensive treatment for plantar diabetic foot ulcers. Total contact casting has several disadvantages, including joint stiffness, muscle atrophy, the possibility of new ulcerations and skin breakdown, labor-intensive application, and possible laceration of the patient during cast removal. Contact dermatitis and fungal infection also may occur and should be treated with appropriate topical medications and temporary abstinence of casting. Patient compliance due to the absence of pain is also an issue. Although TCC is an ambulatory procedure, the patient is required to limit ambulation to one-third of normal. This often requires counseling and close follow-up while the cast is in place. Vascularity must be carefully evaluated before cast application. Lavery et al18 discovered that TCC causes postural instability in the ambulating patient as compared to a tennis shoe or removable cast walker; therefore, the well being and safety of the patient must be strongly considered before recommending the device. requires frequent adjustments to accommodate for reductions in edema. Prefabricated walker. Originally designed for the treatment of fractures and sprains, a prefabricated walker may be useful in the offloading treatment of diabetic foot ulcers.24-26,59,60 Hanft et al25 performed a retrospective study of more than 300 patients with plantar diabetic foot ulcers and demonstrated a healing rate of 85% within 13 weeks with an average time to closure of 5.51 weeks (± 1.02 weeks). In another study, the prefabricated walker has been shown to reduce foot pressures by as much as 56% to 58% and one specific model by 63% to 70%.26 Diabetic ulcerations must be protectively padded and closely monitored. Prefabricated walkers are of additional benefit because they can be removed to inspect and treat ulcerations as needed and can be reused in cases of recidivism. Other advantages appear similar to that of the CROW boot. The caveat lies in the patient’s potential for noncompliance. Healing sandal. This device is constructed with a dual density total contact orthotic made of plastazote. The orthotic contains a cutout under the ulcerated area, and the edges are skived (beveled) to minimize stress. 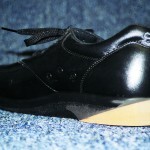 The insole is then placed in a Darco-type postsurgical shoe. Hanft et al29 performed a study of more than 500 patients with plantar diabetic foot ulcerations and demonstrated a healing rate of 74% within 13 weeks with an average time to closure of 7.11 weeks (± 2.35 weeks). Advantages include a lightweight design that is more aesthetically pleasing than the TCC or CROW boot. The main disadvantage is poor control of foot motion, which may lead to increasing stress at the lesion site. Reverse IPOS heel relief shoe. This appliance offloads at the heel with a shoe design that is open at the back and angled in 10º of plantar flexion. Although lightweight and relatively inexpensive, this device may create gait instability and difficulty with balance. L’Nard splint/multiboot. This device enables pressure-free suspension without foot irritation and features a swing-out antirotation bar and height-adjustable footplate to keep the bedding from pressing on the toes and foot. Patella tendon bearing brace (PTB). This custom offloading brace transfers weight from the foot to the patella and properly positions the foot for ambulation. The modality also increases rotational control of the lower extremity; thus, reducing pressure to prevent and treat distal ulcerations.30 Its custom-molded polypropylene copolymer is designed as a “clamshell” AFO and fits footwear that has additional depth. The patella tendon bearing brace has decreased the rear foot mean forces by at least 32%.31 Disadvantages include size, cost, and aesthetics. The device is also confining, bulky, creates additional pressure on the patella, and may be a factor in noncompliance because it is removable. Prefabricated pneumatic walking brace (PPWB). Using inflatable and adjustable air cells, this device functions as a removable cast. One study revealed that the PPWB was superior to the TCC in decreasing plantar pressures;32 another found that the two were equivalent.63 Benefits include reasonable cost and the ability to inspect a wound. One disadvantage is the potential for patient noncompliance. MABAL shoe/Scotch boot. This is a removable fiberglass combination of a cast and a shoe (the initials represent an acronym for its inventors and place of origin). Hissink et al33 studied patients with a total of 23 ulcerations and discovered that 21 healed with a mean healing time of 34 days (seven to 75 days). It was concluded that the MABAL shoe provided healing of neuropathic diabetic foot ulcers comparable to existing methods of treatment. The main advantages of this modality include mobilization of the ankle, removability, and less time-consuming application when compared to the TCC. An additional modification made by the authors includes the attachment of Velcro between the bottom of the shoe and the sole, allowing for the removal of the sole during sleeping, if desired. The literature supports the premise that the total contact cast represents the “gold standard” for the treatment of forefoot and midfoot ulcers as well as Eichenholtz classification 1 and 2 Charcot foot disease. Prefabricated walkers also achieve significant reduction of plantar pressures at sites of neuropathic ulceration. Alternatives include standard below-knee casts, CROW boots, and walking braces. Additional modalities include IPOS shoes, pneumatic walking braces, healing sandals, PTB, AFO, MABAL shoes, and L’Nard splints. Part 2 of this article will address preventing ulcer recurrence and management of Charcot foot and foot amputations. Look for it in the January 2010 issue of LER. Robert J. Snyder DPM, FACFAS, CWS, and is a faculty physician at the Wound Healing Center, University Hospital, Tamarac, FL, and a faculty physician and director of wound management education at the Wound Healing Center, Northwest Medical Center, Margate, FL. Karen K. Lanier, CPed, is CEO of Branier Orthopedic Custom Molded Shoes in Sebring FL. This two-part series is reprinted with permission from: Snyder RJ, Lanier KK. Offloading difficult wounds and conditions in the diabetic patient. Ostomy Wound Management 2002;48(1):22-35. The text has been edited to reflect new developments since the original publication date. 1. Greene DA, Feldman EL, Stevens M. Neuropathy in the diabetic foot: new concepts in etiology and treatment. In: Levin ME, O’Neil LW, Bowker JH, eds. The Diabetic Foot, 5th ed. St. Louis, Mo. : Mosby Year Book; 1993. 2. Jiwa F. Diabetes in the 1990s. An overview. Stat Bull Metro Insurance Company. 1997;78:2-8. 3. Brod M. Quality of life in patients with diabetes and lower extremity ulcers: patients and caregivers. Qual Life Res 1998;7(4):365–372. 4. American Diabetes Association. Position statement; foot care in patients with diabetes mellitus. Diabetes Care. 1995;18(suppl1):S26–S27. 5. National Institutes of Health, National Institute of Diabetes and Digestive and Kidney Diseases (NIDDK). Prevention and early intervention for diabetes foot problems. Feet Can Last a Lifetime. Bethesda, Md. : NIDDK; 1998. 6. Glover JL, Weingarten MS, Buchbinder DS, et al. A 4-year outcome-based retrospective study of wound healing and limb salvage in patients with chronic wounds. Adv Wound Care 1997;10(1):33–38. 7. Steed DL, Donohoe D, Webster MW, Lindsley L. Effect of extensive debridement and treatment on the healing of diabetic foot ulcers. J Am Coll Surg 1996;183(1):61–64. 8. Boulton AJ. The diabetic foot. Med Clin North Am1988;72(6):1513–1530. 9. Janisse DJ. Prescription insoles and footwear. Clin Podiatr Med Surg 1995;12(1):41–61. 10. Lavery LA, Vela SA, Lavery DC, Quebedeaux TL. Reducing dynamic foot pressures in high-risk diabetic subjects with foot ulcerations: a comparison of treatments. Diabetes Care 1996;19(8):818–821. 11. Levin ME. Preventing amputation in the patient with diabetes. Diabetes Care 1995;18(10):1383–1392. 12. Coleman WC, Brand PW, Birke JA. The total contact cast. A therapy for plantar ulceration on insensitive feet. J Am Podiatr Assoc 1984;74(11):548-552. 13. Myerson M, Papa J, Eaton K, et al. 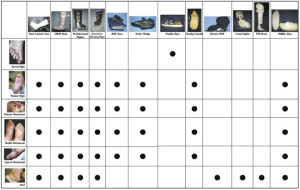 The total contact cast for management of neuropathic plantar ulceration of the foot. J Bone Joint Surg Am 1992;74(2):261–269. 14. Dhawan SK, Conti SF. Use of total contact casting in the diabetic foot. Foot Ankle Clin 1997;2(1):115–136. 15. Birke JA, Sims DS Jr, Buford WL. Walking casts: effect on plantar foot pressures. J Rehabil Res Dev 1985;22(3):18-22. 16. Sinacore DR, Mueller MJ, Diamond JE, et al. Diabetic plantar ulcers treated by total contact casting. A clinical report. Phys Ther 1987;67(10):1543–1549. 17. Hanft JR, Surprenant MS. Is total contact casting the gold standard for the treatment of diabetic foot ulcerations? Abstract presented at: Joint Annual Meeting and Scientific Seminar; February 9, 2000; Miami, Fla.
18. Lavery LA, Fleischli JG, Laughlin TJ, et al. Is postural instability exacerbated by offloading devices in high-risk diabetics with foot ulcers? Ostomy Wound Manage 1998;44(1):26–34. 19. Armstrong DG, Liswood PL, Todd WF. Contra-lateral limb during total contact casting. A dynamic pressure and thermometric analysis. J Am Podiatr Med Assoc 1995;85(12):733–737. 20. Armstrong DG, Lavery LA, Harkless LB. Options for off-loading the diabetic foot. Wounds 2000;12(6):30B–34B. 21. Pollard JP, Le Quesne LP. Method of healing diabetic forefoot ulcers. Br Med J 1983;286(6363):436–437. 22. Huband MS, Carr JB. A simplified method of total contact casting for diabetic foot ulcers. Contemp Orthop 1993;26(2):143–147. 23. Anderson RB, Davis WH. The pedorthic and orthotic care of the diabetic foot. Foot Ankle Clin 1997;2(1):137–151. 24. Ayaso F, Gorgon D, Lui E. Review of treatment modalities in the off-loading of diabetic foot ulcers. Podiatric Medical Review 2000;6(2):55–59. 25. Hanft JR, Surprenant MS. The use of the fixed ankle walker for the treatment of plantar diabetic foot ulcerations. ACFAS Abstract presented at: Joint Annual Meeting and Scientific Seminar, American College of Foot and Ankle Surgeons; February 8-12, 2000; Miami, Fla.
26. Fleischli JG, Lavery LA, Vela SA, et al. Comparison of strategies for reducing pressure at the site of neuropathic ulcers. J Am Podiatr Assoc 1997;87(10):466–472. 27. McDermott JE, ed. The Diabetic Foot. American Academy of Orthopedic Surgeons Monograph series. 1995;17–18. 28. Chantelau E, Breuer U, Leisch AC, et al. Outpatient treatment of unilateral diabetic foot ulcers with “half-shoes.” Diabet Med 1993;10(3):267–270. 29. Hanft JR, Surprenant MS. The use of the custom molded healing sandal for the treatment of plantar diabetic foot ulcerations. Abstract presented at: Joint Annual Meeting and Scientific Seminar, American College of Foot and Ankle Surgeons; February 8-12, 2000; Miami, Fla.
30. Rheinstein J, Yanke J, Marzano R. Developing an effective prescription for lower extremity prosthesis. Foot Ankle Clin North Am 1999;4(1):113–138. 31. Guse ST, Alvine FG. Treatment of diabetic foot ulcers and Charcot neuroarthropathy using the patellar tendon-bearing brace. Foot Ankle Int 1997;18(10):675-677. 32. Baumhauer JF, Wervey R, McWilliams J, et al. A comparison study of plantar foot pressure in a standardized shoe, total contact cast, and prefabricated pneumatic walking brace. Foot Ankle Int 1997;18(1):26–33. 33. Hissink RJ, Manning HA, Van Baal JG. The MABAL shoe, an alternative method in contact casting for the treatment of neuropathic diabetic foot ulcers. Foot Ankle Int 2000;21(4):320–323. 34. Guzman B, Fisher G, Palladino SJ, Stavosky JW. Pressure-removing strategies in neuropathic ulcer therapy. An alternative to total contact casting. Clin Podiatr Med Surg 1994;11(2):339–353. 35. Pollo FE, Brodsky JW, Crenshaw SJ, Kirksey C. Plantar pressures in total contact casting versus a diabetic walking boot. Foot Ankle Int 2003;24(1):45-49. 36. Hayes S. The pedorthic prescription. Ambulatory Foot Care Course, American Academy of Orthopaedic Surgeons, San Francisco, Calif.; 1987. 37. Helm PA, Walker SC, Pullium GF. Recurrence of neuropathic ulcerations following healing in a total contact cast. Arch Phys Med Rehabil 1991;72(12):967–970. 38. Centers for Disease Control, Disease Prevention and Health Promotion. Economic aspects of diabetes services and education. US Department of Health and Human Services, Atlanta, Ga. Selected annotations. 1992. 39. Lavery LA, Lavery DC, Quebedeaux-Farnham TL. Increased foot pressures after great toe amputation in diabetes. Diabetes Care 1995;18(11):1460–1462. 40. Murray HJ, Boulton AJ. The pathophysiology of diabetic foot ulceration. Clin Podiatr Med Surg 1995;12(1):1-17. 41. Frykberg RG, Kozak GP. The diabetic Charcot foot. In: Kozak GP, Hoar CS, Rowbotham JL, et al, eds. Management of Diabetic Foot Problems. Philadelphia: WB Saunders Company; 1994:103–112. 42. Janisse DJ. Prescription insoles and footwear. Clin Podiatr Med Surg 1995;12(1):41–61. 43. Pedorthic Footwear Association. Introduction to Pedorthics. Columbia, Md. ; 1998. 44. Cohen MM, Brietstein RJ, Brill L. Wound Care Q&A: Improve your treatment of Charcot foot, part II. Podiatry Today 2000;Jul/Aug:79–81. 45. Brower AC, Allman RM. Pathogenesis of the neurotrophic joint: neurotraumatic vs. neurovascular. Radiology. 1981:139:349-354. 46. Sanders LJ, Frykberg RG. Diabetic neuropathic osteoarthropathy: Charcot foot. In: Frykberg RG, ed. The High Risk Foot in Diabetes Mellitus. New York: Churchill Livingston; 1991:297–338. 47. Greene DA, Feldman EL, Stevens M. Neuropathy in the diabetic foot: new concepts in etiology and treatment. In: Levin ME, O’Neil LW, Bowker JH, eds. The Diabetic Foot, 5th ed. St. Louis, Mo. : Mosby Year Book; 1993:135. 48. Eichenholtz SN. Charcot’s Joints. Springfield, Ill.: Charles C. Thomas; 1966. 49. Johnson JE. Surgical reconstruction of the diabetic Charcot foot and ankle. Foot Ankle Clin 1997;2(1):37–55. 50. Johnson JE, O’Brien TS, Hart TS, et al. Reconstruction of the Charcot’s foot and ankle: an outcome study of long-term results. 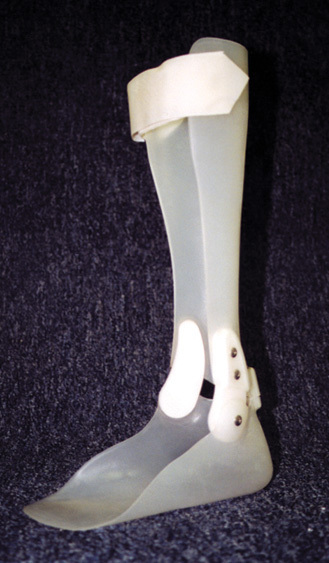 Presented at the American Orthopedic Foot and Ankle Society 12th Annual Summer Meeting; June 27-30, 1996; Hilton Head, SC. 51. Banks AS. A clinical guide to Charcot foot. In: Kominsky SJ, ed. Medical and Surgical Management of the Diabetic Foot. Baltimore: Mosby; 1994:115–143. 52. Krause JO, Brodsky JW. The natural history of type 1 midfoot neuropathic feet. Foot Ankle Clin 1997;2(1):1–22. 53. Frykberg RG, Mendeszoon ER. Charcot arthropathy: pathogenesis and management. Wounds. 2000;12(6):35B-42B. 54. Waters RL, Perry J, Antonelli D, Hislop H. Energy cost of walking of amputees: the influence of length of amputation. J Bone Joint Surg Am 1976;58(1):42–46. 55. Marks RM. Mid-foot/mid-tarsus amputations. Foot Ankle Clin 1999;4(1):1–16. 56. Campbell JT. Syme’s, Boyd’s, Chopart’s and Pirogoff’s amputations. Foot Ankle Clin 1999;4(1): 39–62. 57. Lehman JF, Price R, Koon G. Worth the weight: prosthetic mass and gait. Biomechanics 1998;5(12):15–20. 58. Armstrong DG, Nguyen HC, Lavery LA, et al. Off-loading the diabetic foot wound: A randomized clinical trial. Diabetes Care 2001;24(6):1019-1022. 59. Piaggesi A, Macchiarini S, Rizzo L, et al. An off-the-shelf instant contact casting device for the management of diabetic foot ulcers: a randomized prospective trial versus traditional fiberglass cast. Diabetes Care 2007;30(3):586-590. 60. Pollo FE, Brodsky JW, Crenshaw SJ, Kirksey C. Plantar pressures in fiberglass total contact casts vs. A new diabetic walking boot. Foot Ankle Int 2003;24(1):45-49. 61. Birke J, Kewis K, Penton A, et al. The effectiveness of a modified wedge shoe in reducing pressure at the area of previous great toe ulceration in individuals with diabetes mellitus. Wounds 2004;16(4):109-114. 62. Landsman AS, Sage R. Off-loading neuropathic wounds associated with diabetes using an ankle-foot orthosis. J Am Podiatr Med Assoc 1997;87(8):349-357. 63. Hartsell HD, Fellner C, Saltzman CL. Pneumatic bracing and total contact casting have equivocal effects on plantar pressure relief. Foot Ankle Int 2001;22(6):502-506. 64. Birke JA, Pavich MA, Patout Jr CA, Horswell R. Comparison of foot ulcer healing using alternative off-loading methods in patients with diabetes mellitus. Adv Skin Wound Care 2002;15(5):210-215. 65. Knowles EA, Boulton AJ. Do people with diabetes wear their prescribed footwear? Diabet Med 1996;13(12):1064-1068. 66. Macfarlane DJ, Jensen JL. 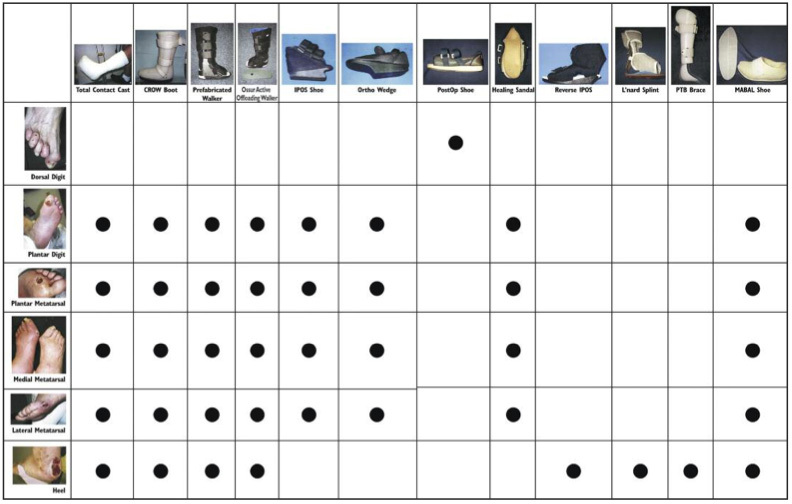 Factors in diabetic footwear compliance. J Am Podiatr Med Assoc 2003;93(6):485-491. 67. Armstrong DG, Lavery LA, Kimbriel HR, et al. Activity patterns of patients with diabetic foot ulceration: patients with active ulceration may not adhere to a standard pressure off-loading regimen. Diabetes Care 2003;26(9):2595-2597. 68. Chantelau E, Haage P. An audit of cushioned diabetic footwear: relation to patient compliance. Diabet Med 1994;11(1):114-116. 69. Ashry HR, Lavery LA, Murdoch DP, et al. Effectiveness of diabetic insoles to reduce foot pressures. J Foot Ankle Surg 1997;36(4):268–271. 70. Lord M, Hosein R. Pressure redistribution by molded inserts in diabetic footwear: a pilot study. J Rehabil Res Dev. 1994;31(3):214–221. 71. Brown D, Wertsch JJ, Harris GF, et al. Effect of rocker soles on plantar pressures. Arch Phys Med Rehabil 2004;85(1):81-86. Valmassy RL. Clinical Biomechanics of the Lower Extremities. St. Louis: Mosby Yearbook; 1996:365–366. Armstrong DG, Abu-Rumman PL, Nixon, BP, Boulton, AJM. Continuous activity monitoring with persons at high risk for diabetis-related extremity amputation. J Am Podiatr Med Assoc. 2001;91(9):451–455. Figure 1. Typical neuropathic ulcer. Figure 2. The Snyder-Lanier algorithm for offloading. Figures 3a. 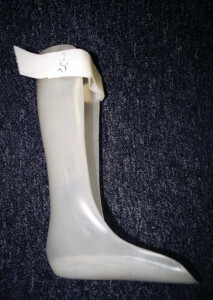 Example of an articulating AFO. Figures 3b. Example of a solid ankle AFO.